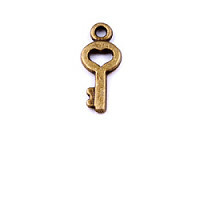 Metal Key pendant in the shape of a key has many applications. It is frequently used symbol on the occasion of the wedding. It is double sided, made of non magnetic metal. This Charm can be used for decorative purposes. Interestingly will excel on a ribbon tied around a candlestick, paper greeting card or a gift box. It is also suitable for making bookmarks or decorative pendants on the purse, bag or key-chain.